There are different ways to prepare dosa. 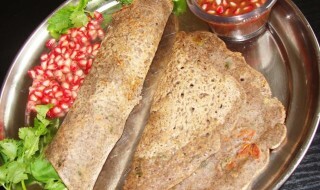 However, Ragi dosa is a great option if you’re on a weight loss diet. Most of the packed cereals that we find in the market are filled with sugar, gluten and other harmful ingredients like HFCS (High Fructose Corn Syrup). However, Ragi stands out for its health benefits and ragi dosa is a great alternative for people trying to avoid rice or wheat. Read the recipe to learn more about it. Soak urad dal and methi seeds for about 6 hours and grind together. Mix ragi flour and salt and allow them to ferment overnight(same as dosa batter consistency). At the time of preparation, heat the tava and pour 1 full spoon of batter and make a dosa. Keep doing it depending on the number of dosas you wish to prepare.